Stop Dry Cleaning. Start Laundering. Save Your Wardrobe AND Your Wallet! 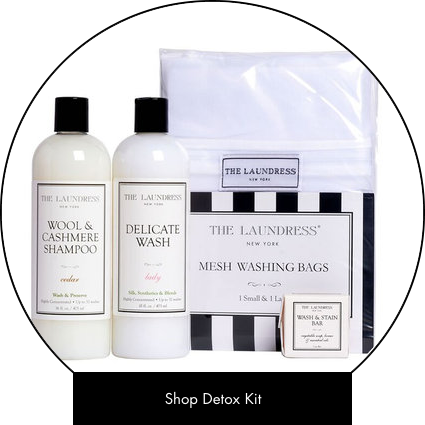 90% of items labeled "dry clean only" are washable using The Laundress products. Our eco-friendly and highly effective laundry and fabric care solutions are specially formulated for individual fabrics and care for even your most delicate items - without harsh chemicals. Motivated by a desire to prolong the life of beloved garments and avoid items ruined by the dry cleaners, The Laundress Co-Founders Gwen Whiting and Lindsey Boyd used sophisticated science to develop laundry formulas made with natural ingredients that are nontoxic and allergen and phosphate-free. "I will never send my cashmeres or woolens to the dry cleaners again! The smell is luscious with such a creamy texture - little wonder the sweaters come out so-o soft…"
"I love getting into bed on these hot nights in clean sheets that have been washed in this product [Delicate Wash]. Bought lots of bottles to give as gifts to friends and family."